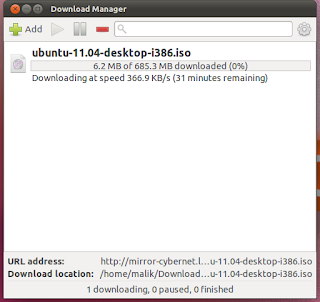 We've been feeling since a long time that Ubuntu lacks a proper standalone download manager. Thanks to Ubuntu Member Maia Kozheva who felt the same and started coding a new download manager. Version 0.1.6 is now available for installation. A basic GNOME download manager, supporting all URL protocols known by GIO/GVFS. This includes, among others, HTTP, HTTPS, FTP and SMB. Pausing, resuming, and restarting downloads upon application restart. An application indicator, or a notification area icon for platforms without Ayatana libraries. Ability to add downloads via the command line and D-Bus, for browser extension writers. Notification bubbles upon starting and finishing downloads (can be disabled). Ability to run an arbitrary command when a download completes. A monochrome icon (planned for 0.2). Different download folders for different file types. Limiting download speed and number of files downloaded simultaneously. Multiple download streams per file. No support for Global Menu. Once installed, you can start it from Applications > Accessories > Internet in Gnome and by pressing <Super> and searching for 'Steadyflow' in Unity. For making it start automatically when you boot your PC, you'll need to add a new entry under Startup Applications. Enter steadyflow in the command box. For integrating Steadyflow in Firefox, you'll need the Flashgot FireFox add-on. Download here. You'll need to restart FireFox after installation of the add-on. In most cases, FlashGot automatically detects Steadyflow and integrates it in FireFox. If it doesn't work for you, go to FireFox Tools > Add-ons > Extensions > FlashGot > Preferences and choose Steadyflow. For integrating Steadyflow in Google Chrome or Chromium browser, visit the link below in Chrome(ium). Download the corresponding .crx file for your architecture and install extension when prompted. It would just add an option to "Download with Steadyflow" to the context menu when you right click a link.